Eitan: New forces were taking control of my life and I couldn’t, or perhaps didn’t want to, avoid them. Here came the offers and the pressures, the strangers and the advisers . . . every day I was approached by people I’d never talked to who knew what I needed, or who needed to know what I thought. Could I lend my voice, my support, my opinion? It didn’t matter to them that, in most cases, I had no opinion. 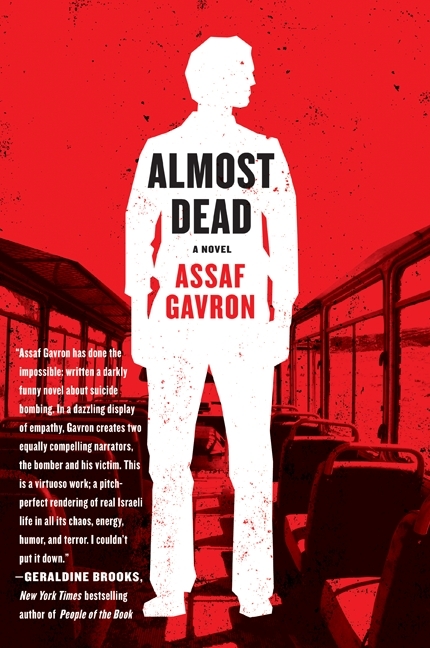 Almost Dead is a witty, sarcastic gem of a novel about day to day life in Israel with mass chaos going on: suicide bombing, border patrol. Author Assaf Gavron takes on both sides with equal parts candor, empathy and ridiculousness. On one side there’s Eitan “Croc” Einoch who survives three suicide bombings in one week and becomes a national celebrity. Fahmi Sabih lies in a coma. Through his conscience and dreams we learn about this young man who may not quite be committed to the Jihad– at least not nearly as much as his brother. When reading Almost Dead, it’s impossible to choose one side. Both have compelling reasons to choose their paths. Gavron delves into Gaza, Jerusalem, Tel Aviv, religious Israelis and Palestinians and some that are fairly agnostic. What will it take to co-exist in one desert area? Gavron writes in a winning conversational manner. Almost Dead will make you think for days after finishing it. This entry was posted on August 27, 2010, 22:27 and is filed under Books. You can follow any responses to this entry through RSS 2.0. Both comments and pings are currently closed.